Sometime an ingredient just speaks to me. I’m not sure whether I was born with this gift or if I’ve watched too many food shows and browsed too many cookbooks. Like seashells on the surf, ideas for meals surface in my mind and evolve throughout the day until evening, when they’re realized into dinner. This particular CSA-inspired dish was especially fun to concoct. In the produce box last week, we received a bunch of beet greens, with adorable tiny beets attached. The farmer’s newsletter shared that a single beet seed can contain anywhere from one to eight embryos, each of which will grow into a beet plant. And when there are many little beet plants sprouting in one small hole, they have to compete for nutrients and you wind up with baby beets! These darlings were totally tender and delicious, which is great since they were way too small to peel. And while beet roots are definitely getting a lot of culinary play right now, fresh beet greens are super tasty as well: earthy and faintly sweet with a similar flavor profile and texture to Swiss chard, but with slightly less bitterness. So here’s the basic formula: I threw short grain brown rice in the rice cooker an hour before dinner, then marinated ¼ inch thin strips of tempeh in a mixture of ketchup, sesame oil, tamari (gluten free soy sauce), lime juice, powered ginger and garlic, coriander, and cumin. While the rice cooked and the tempeh marinated, I washed and trimmed the baby beets and their greens. I set the oven to 450°F and pulled the tempeh from the fridge, laying it on a foiled lined baking sheet next to the oil slathered beets, which went into the oven for about 20 minutes, getting flipped and turned halfway through. Meanwhile, I sautéed the beet greens in garlic and olive oil until just tender and bright green. This dish is a feast for the eyes as well as the stomach: for each diner, layer salted brown rice in the bottom of a shallow bowl and top with sautéed beet greens. Next lay down 4-5 strips of golden brown tempeh and nestle 4-5 baby beets (or chopped large beets) atop it all. Finish with a hefty dollop of pesto, made with any herbs or greens you have around the house. I try to make a big jar of pesto right when I pick up our produce and then use it all week long for eggs, pasta salad, sandwiches and of course, to add flavor and color to pretty dishes like this one. There you have it: a whole foods based meal with color, flavor, and an array of nutrients. This basic idea can be interpreted in so many different varieties, changing up the beet greens for spinach, kale or chard, and the tempeh for tofu, chicken, eggs, or fish. The beets of course could be any seasonal veggie that lends itself well to roasting. 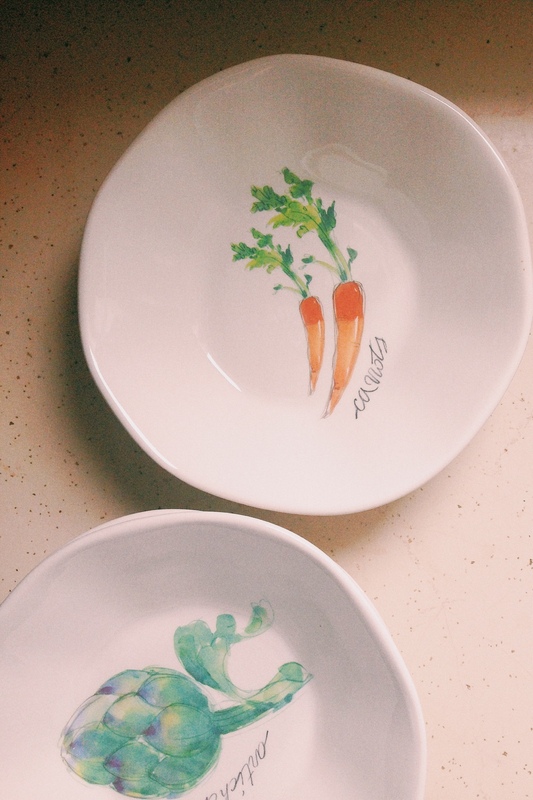 Play around and have fun with your dinners! Look for inspiration and begin brainstorming throughout the day and by the time you’re getting asked “what’s for dinner?” you may find you already have a pretty solid plan. "The cheese stands alone." I always felt kinda bad for the cheese. And sometimes I feel bad for the greens too, because they too often stand alone as a side dish, a supporting act. Collard greens in particular have been pigeonholed into the token green(ish) food on our plates of barbeque pulled pork and mac n' cheese. Well, no more! Today, collards get to grab a partner, do-si-do, and star in the show. Collard greens are thick, some might even called them tough. They're typically cooked for a long time, with some kind of fatty animal product, like bacon or ham hocks, during which they lose much of their beautiful dark green color and come out of the pot bearing more of a putrid olive shade. When I got a bunch of collards in my CSA box last week, I vowed to give them the treatment they deserved. And I came up with this quick and tasty recipe for collard greens and chicken chorizo tacos. Heat a saute pan over medium heat. Add the chorizo and cook, stirring occasionally to break up the meat. Add the garlic and the chopped collards. If the pan seems a little dry (this will depend on how much fat is in your chorizo), stream in some olive oil to allow the greens to saute without charring. Continue to cook the collards and chorizo together until the chicken is no longer pink and the greens have wilted and turned dark green in color. Taste a piece of the greens, paying attention to how they chew: you want some texture remaining but not the raw roughness they started with. If you like how things are going here, add the taco seasoning and tomato sauce, stirring to incorporate. Cook a few more minutes over medium low heat to allow the flavors to meld. Meanwhile, heat your tortillas over a stove flame or in the microwave wrapped in damp paper towel, then serve the tacos immediately, topping the collard and chorizo mixture with salsa, avocado, green onions, and a squeeze of lime. Happy first day of summer. I’ve issued myself a challenge: one blog entry per week showcasing the produce from our weekly CSA box. We’re two boxes in and I’ve yet to write a post about the awesomely fresh, local, organic veggies I’ve been cooking, eating and loving lately , so looks like this one’s gonna be a two-fer folks. These recipes will be more loose and versatile than others I’ve posted; they’re meant to inspire you to grab whatever’s fresh at the market and make from it something simple and delicious, that showcases the flavors of the season. Please interpret these with your own creative twist, and leave a comment about what you came up with, I’d love to hear from you. Let’s share some local love! 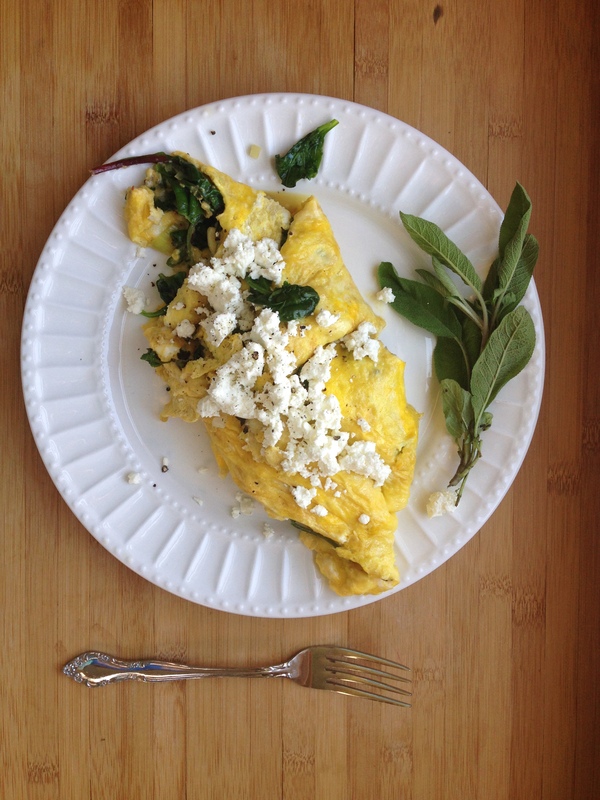 From some of the shining stars of our first box, which we conveniently pick up at the nearby Tosa farmer’s market every Saturday morning, I whipped up a tasty midday omelette filled with leeks, sage, baby arugula (not from the CSA ) and goat cheese. I’m no omelette pro, but the key to keeping it together seems to be touching the eggs as little as possible while they’re cooking. I’m sure they are plenty of excellent omelette-making tutorials on YouTube so I won’t go into great depth with the instructions. Heat ½ tablespoon of the butter or oil in a large skillet over medium heat. When butter is melted or oil runs loosely in the pan, add the leeks and stir until slightly softened. Next, add the arugula and sage, cooking until wilted. Turn off heat and remove mixture to a separate plate; cover with a bowl to keep warm. Wipe the skillet clean with a paper towel. Whisk together the eggs, cream, and salt in a bowl. Add another ½ tablespoon of fat to the skillet. When butter is melted or oil runs loosely in the pan, pour the eggs into it and swirl to cover the surface of the skillet. Let the eggs sit for a quick minute, until the bottom of the omelette is just firm. Then, using a rubber spatula or wooden spoon, gently peel back the cooked eggs and tilt the pan so the runny eggs run into the open space in the skillet. Continue this process maybe one or two more times until the eggs are mostly cooked but still soft. 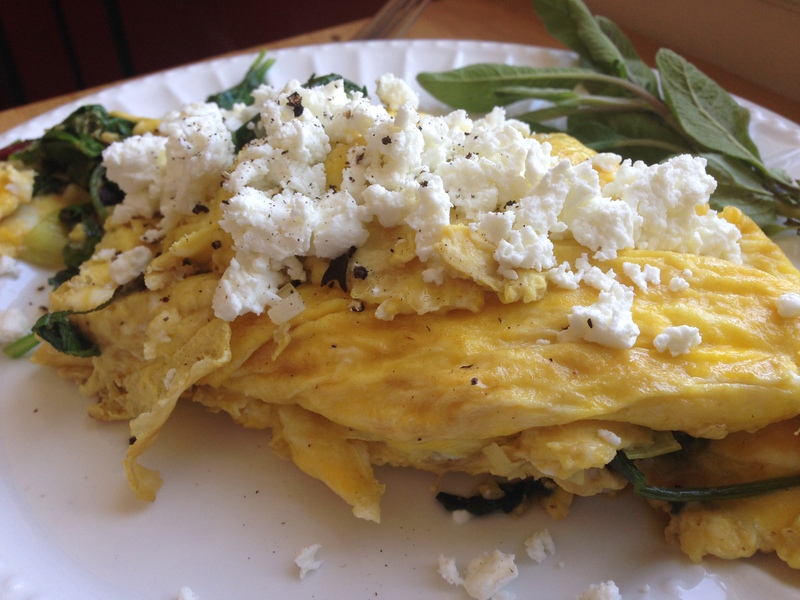 Add the arugula mixture to the center of the omelette in a loose line, then sprinkle the filling with about half of the goat cheese. Carefully fold the omelette edges over the filling. Cover the skillet and cook for one more minute if you are concerned there may be some runny egg lurking. Remove omelette from the skillet and serve topped with remaining goat cheese crumbles, pepper, and a sage garnish if you’re feelin’ fancy. Cut in two and enjoy with a loved one or save half for tomorrow’s lunch (cold omelette = delish). Week two’s box brought us strawberries, kale, leeks, radishes, asparagus, and more! 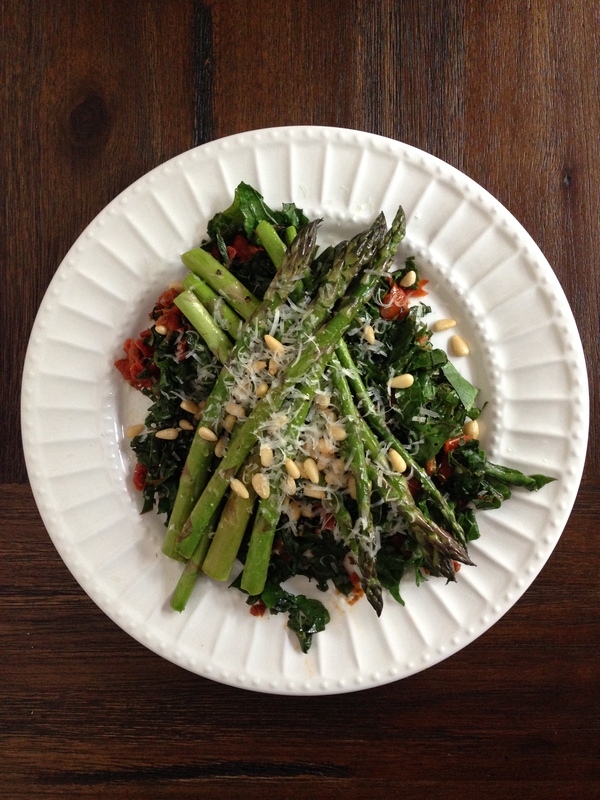 Today, I whipped up a simple cooked salad of sautéed kale and asparagus, sun-dried tomatoes, pine nuts and parmesan which we enjoyed alongside a rotisserie chicken and some good crusty bread (wine too). Heat half of the oil in a large skillet, medium heat. 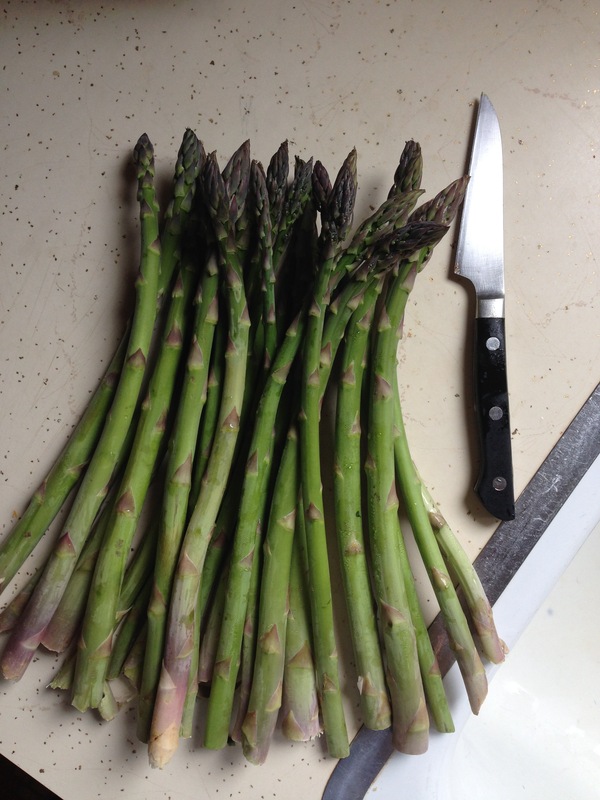 Add the asparagus and sauté until bright green and still very crisp, about 4 minutes. Season with nutmeg, salt and pepper. Remove from pan and set aside. Heat the remaining oil in the same skillet. Add the chopped kale leaves and sauté until bright green and tender. Add the sun dried tomatoes, cooking minute or two longer. Remove skillet from heat and stir in parmesan and pine nuts. Salt and pepper to taste, add addition olive oil as desired. 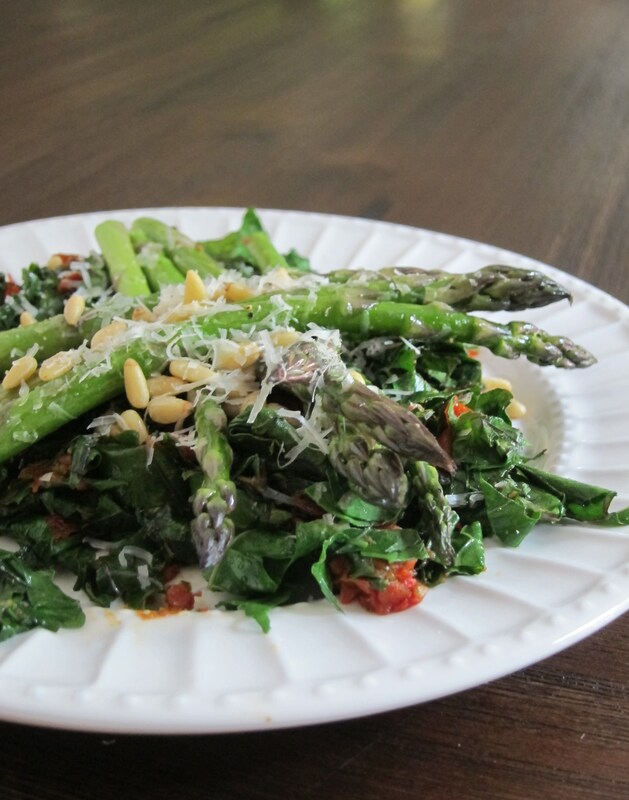 In a large bowl or on a serving platter, first make a layer of the sautéed kale, then top with the asparagus, finishing with more parmesan and pine nuts for garnish. 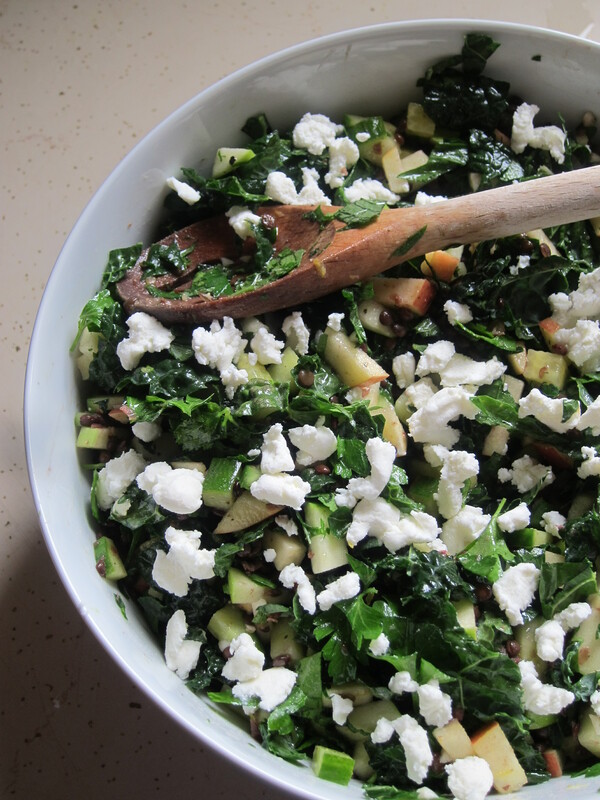 I’ve had this crunchy kale salad on my to-make list for quite some time. It hails from the Sprouted Kitchen blog, one of my (any many others’) fav sites for creative, super-healthy, gorgeous and invariably delicious recipes. 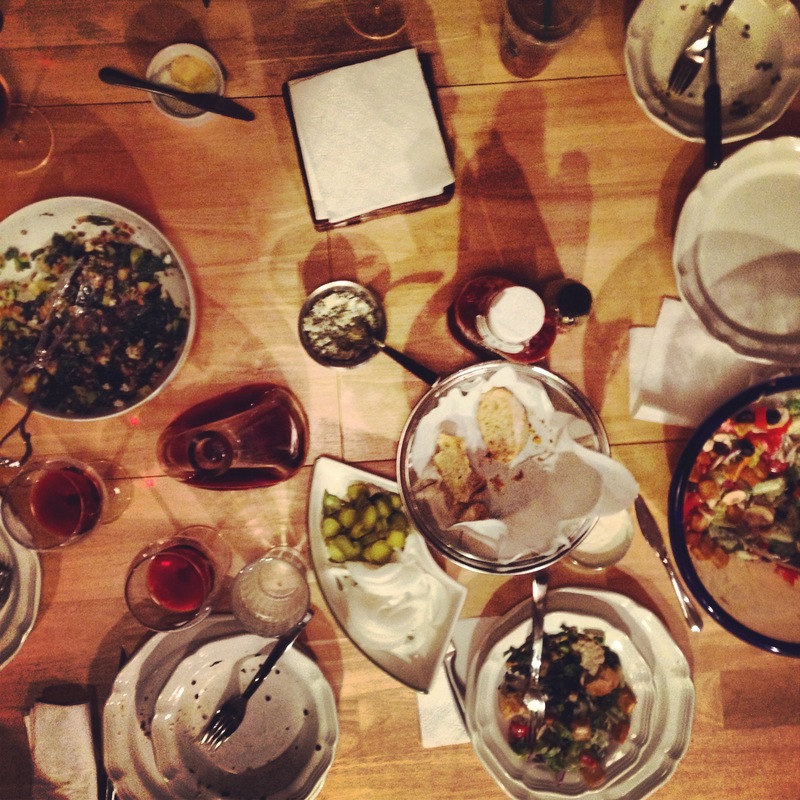 So on Sunday morning, when my dad texted: “dinner party: 5 PM,” I knew just what I’d be bringing to the table. This diversely textured salad does demand some chopping, but aside from that it comes together pretty quickly. The only thing you’ve got to plan for is cooking the lentils and roasting the pepitas (raw, green pumpkin seeds) which are both pretty hands-off steps. This salad is a keeper, meaning you can keep it in the fridge and enjoy it for a couple days. There’s lots of lemon juice in the dressing, so the apples won’t go brown on you. 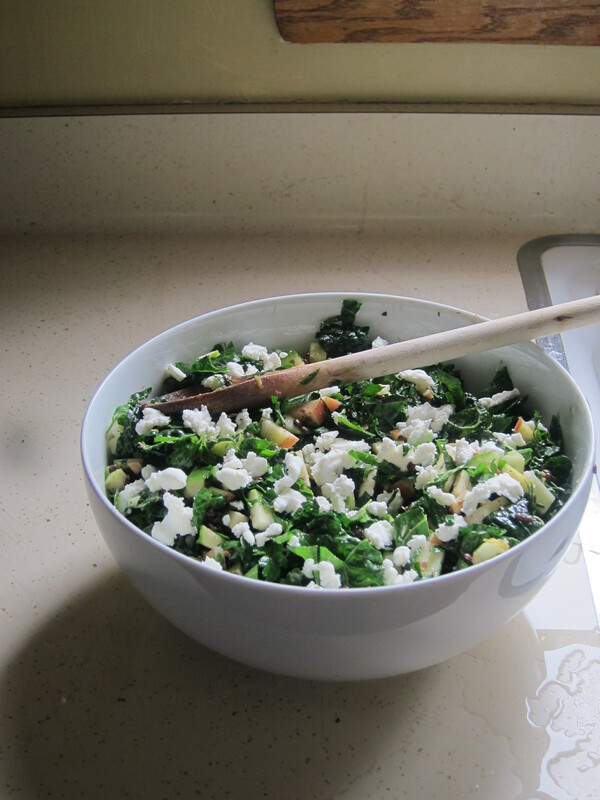 I would definitely say this salad gets better on the second day, since the kale breaks down a bit in the presence of the acidic lemon juice and the flavors have time to meld and mingle. Just remember to leave out the pepitas until you’re ready to dig in so they don’t get soggy. How to make this a one bowl meal: a couple scoops of this salad nestled in with a hunk of goat cheese or feta and a hard-boiled egg and you’ve got yourself a crazy nutritious mouth party. Shazam! 1. 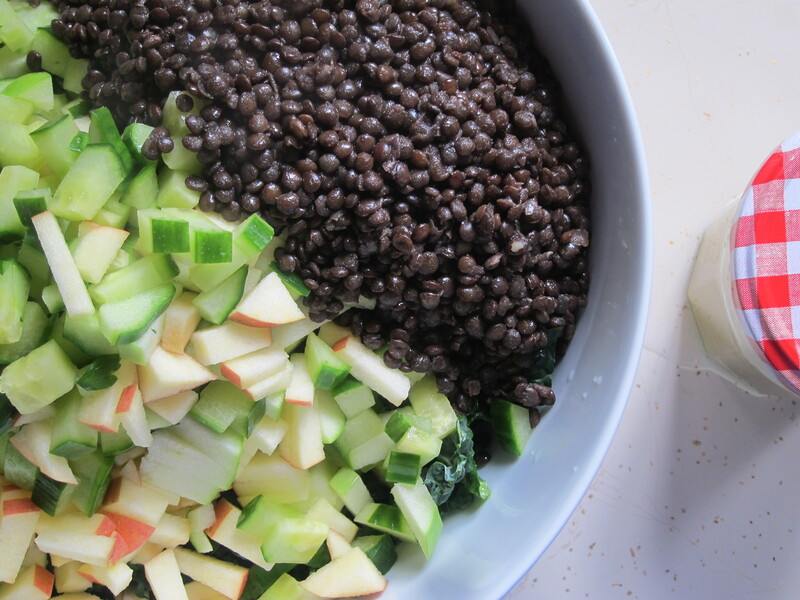 In a large serving bowl, combine the kale, parsley, lentils, apples, and cucumber. 2. 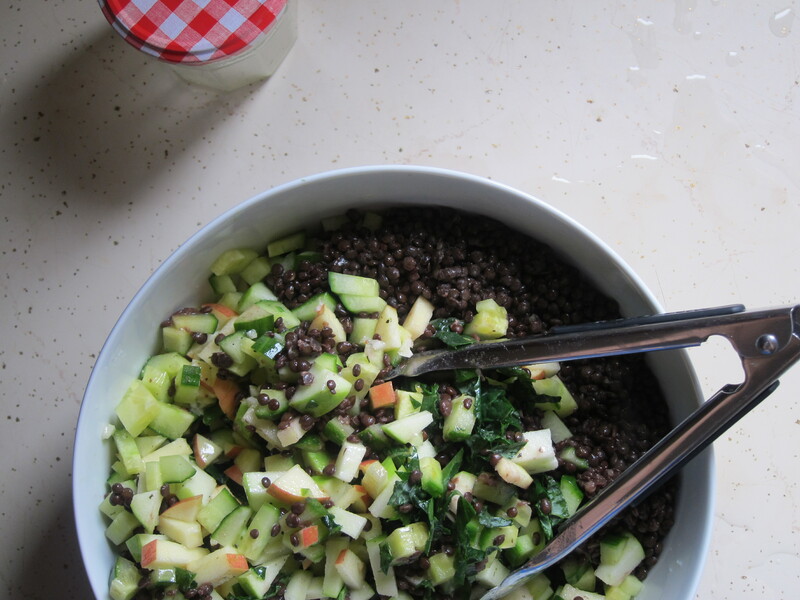 For the dressing, put all ingredients in a jar with a tightly fitting lid and shake until emulsified. If you don’t wanting garlic bits, use a food processor instead. 3. Pour the dressing over the salad and stir to distribute. Garnish with pepitas and cheese of your choice.